ABOUT: 143 Washington Street in August 1872; 301 Washington Street 1880; editorial offices to 202 Summer St. in 1899; partnership dissolved in 1889. Numerous subsidiaries including Cassino Art Company. Dana Estes was champion of international copyright (resulting from continued piracy of Chatterbox, a serial for children); formed Aldine Publishing Co. to publish inexpensive royalty editions of works by standard authors. (DLB 49). Succeeded by Dana Estes & Company (1898-1914). ... were not known mainly for their cheap books, but they did do some publishing of cheap twelvemos. They seem to have been the real publishers of the Aldine series, although the books were issued under the imprint of the Aldine Publishing Company [Publishers' Weekly 33:396 (1888)]. Estes & Lauriat were one the many firms which practiced price-cutting during the 1880s. A bookseller, bewailing the poor conditions in the book trade, wrote to the Publishers' Weekly in 1886 that these conditions were partly due to "Estes & Lauriat's regular special sales, and their widely circulated catalogues, reducing the retail to wholesale prices." [Publishers' Weekly 29:278 (1886)]. (Shove). Dana Estes (1840-1909) and Charles Emelius Lauriat (1842-1920) established Estes & Lauriat in August 1872 and continued the firm under this name, with a number of changes in personnel over the years, until 1898. At that time, Lauriat bought out the published stock of Estes and opened a retail book store on Washington Street, Boston. Estes continued the publishing business under the name Dana Estes & Co. until, by 1915, it was fully absorbed by L. C. Page & Co. (Page being the son of Estes second wife, adopted by Estes). [Tebbel II394-502]. 1885 PTLA. Among "Miscellaneous Books and Remainders": The Popular "Family Editions" of the Poets. 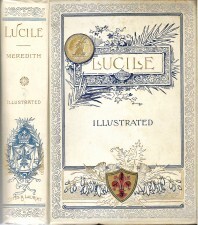 Each volume complete, illustrated, and handsomely bound in cloth, gilt edges... [Longfellow, Whittier and Tennyson]... Owen Meredith's "Lucile" 8vo. $2.50. [and:] Owen Meredith's "Lucile" and "Miscellaneous Poems." With portrait and other illustrations. The celebrated "Household" edition. 12mo. Cloth. Extra. $2.00. 1886 PTLA. "Family edition" as 1885. 1893 PTLA. Among "New Books and New Editions": Although many editions of this charming poem (perhaps the most popular of English poems), have been made with illustrations, this is the first which has been embellished with photogravures from landscape views and authentic photographs of the scenery and localities mentioned in the poem, and which add new interest to the text of the volume. A charming ideal of the heroine, by W.L. Taylor, reproduced in photogravure, will be added as a frontispiece. 1 vol., imperial, cloth, gilt tops... $4.00. PW 30 Sept 1893: "Although many charming editions of this charming poem (perhaps the most popular of English poems) have been made with illustrations, this is the first which has been embellished with photogravures from landscape views and authentic photographs of the scenery and localities mentioned in the poem, and which add new interest to the text of the volume. A charming ideal of the heroine, by W.L. Taylor, reproduced in photogravure, will be added as a frontispiece.... imperial 8vo, cloth, gilt tops.... $4.00"
PW Christmas Bookshelf 1893: "A handsome new holiday edition, substantially uniform with our beautiful Stirling edition of "Lady of the Lake" issued last season. Illustrated with photogravures from landscape views and photographs of the scenery and localities mentioned in the poem. Imperial 8vo, cloth, gilt tops, slip covers (in a box)...$4.00 / A really sumptuous edition of one of the most popular poems in the whole range of English literature. A charming ideal of the heroine, by W.L. Taylor, reproduced in photogravure, is used as a frontispiece." Also mentioned among "Some Illustrated Poems" as directly competing with Stokes Co.'s McIlvaine-illustrated 'flat quarto': "Either is beautiful enough to satisfy any reasonable buyer." 1894-1897 PTLA: A handsome holiday edition of Owen Meredith's masterpiece, printed from new, large type, in a fine open page, and illustrated with twenty magnificent full-page plates in photogravure from landscape views and authentic photographs of the scenery and localities mentioned in the poem, and a charming ideal picture of the heroine by W.L. Taylor, reproduced in photogravure as a frontispiece. Imperial 8vo, handsomely bound in cloth, with original cover design, with slip covers, in a neat cloth box. $4.00. *** Substantially uniform in style with the handsome 'Stirling' edition of "The Lady in the Lake," previously issued by us. In many respects the most sumptuous edition of this phenomenally successful poem yet issued. ----. As above but with base cloth a dark gray rather than white. S&EH.